There was a recent article I read in the Express UK publication that mentioned there is growing evidence that dementia and Alzheimer’s could largely be caused by excess sugar consumption in a person’s diet. The article gives evidence that Alzheimer’s is just a continuation of diabetes, calling it Type III Diabetes. Alzheimer’s and other forms of dementia are the leading cause of needing long term care services and having to use a long term care insurance policy if the person planned ahead and even had one. If this cutting edge theory is true, reducing the sugar consumption in our diets would be the easiest way to save millions of lives and trillions of dollars world wide over the next 50 years. Unlike diseases such as cancer that will kill the victim much faster, Alzheimer’s is cruel in that the person lingers for years and years with often a very low quality of life; all this time while draining the next egg they worked so hard to save. If the person has no savings or long term care insurance to pay for their own care, they then have to depend on society to pick up the bill through government programs such as Medicaid or Welfare. As most know, The United States is 20 Trillion in debt and have over 100 Trillion of unfunded liabilities that future generations will one day the the near future reckon with. If we could plug this one hole and begin to reduce the Alzheimer’s rate it would be such a huge win for us from a humanitarian and economic standpoint. 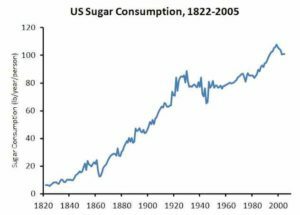 I did a little digging and found this chart showing the explosion of sugar consumption in the United States since 1820. That was the time that mankind began developing tools to mass extract sugar from the sugar cane which drastically dropped the cost and exploded the consumption. In 1820 we ate only 3 pounds per year of sugar and now it’s over 120 pounds a year. This rapid increase in consumption, just from a evolutionary perspective, has simply been too fast for our bodies to keep up with. The next chart shows the huge explosion of Alzheimer’s in our population. To be fair we are living longer and have more time to develop these conditions, but it is the large growth rate in the numbers that just does not look natural and pass the eye test. Self-insure the Long Term Care risk by using your own money. Depend on welfare to pay for your last years. We help people all over the United States plan for this decision with innovative ideas that hedge the risk by moving some of that risk to the insurance company in exchange for a modest premium. There are also some hybrid-long term care insurance products to will refund all the money you ever put in at death tax-free if care is never needed. Fill in the form below and we will FedEx you quotes from the top ten companies so you will not be caught flat footed when your time comes.